As Donald Trump prepares to assume the office of president of the United States, the policies he promised to pursue during the campaign are now beginning to take shape, as a noted "immigration hard-liner" has been named to Trump's transition advisors. Kris Kobach (shown), the secretary of state of Kansas, is helping the president-elect draft an immigration plan that will reflect Mr. Trump's position on the controversial issue and will help him revise many of the previous president's policies. "There's going to be a lot to do there in part because Mr. Trump and Mr. Obama are diametric opposites when it comes to immigration policy, so there will be a lot of changes," Kobach informed a Kansas television station. As anyone who has even casually followed Trump on his road to the White House will know that perhaps the most controversial and certainly the most polarizing plank of the president-elect's immigration platform is the building of a wall along the U.S.-Mexico border. Kobach says the plan for the wall is moving forward. "There's no question the wall is going to get built. The only question is how quickly will it get done and who pays for it," Kobach claims. While the wall is the most high-profile parts of Trump's immigration intentions, it is by no means the only part. The Washington Post reported that Trump has "also has vowed to overturn many of the president's executive actions on immigration, such as Deferred Action for Childhood Arrivals that temporarily shields from deportation people who were brought to the U.S. illegally as children." 5. Immediately terminate President Obama’s two illegal executive amnesties. All immigration laws will be enforced - we will triple the number of ICE agents. Anyone who enters the U.S. illegally is subject to deportation. That is what it means to have laws and to have a country. The plan is comprehensive and ambitious. President Obama was unable to convince Congress to enact his own vision for the country's immigration policy, so he did what any good tyrant would do, he ignored the Constitution, grabbed his infamous pen, and issued executive orders accomplishing the same ends without the messy means of abiding by Constitution's enumerated authority and separation of powers. One of those fiats protected immigrants benefiting from the federal Development Relief Eduction for Alien Minors (DREAM) act and their families from being deported. Trump promises to rescind that order within his first 100 days in office. With such an audacious project ahead of him, Donald Trump's choice of Kobach to guide his team toward that goal is a smart step as he has years of experience in fighting tough battles against those in the federal government who oppose any restriction on the immigration pipeline. In fact, it seems that Kobach is a lightning rod for immigration litigation. 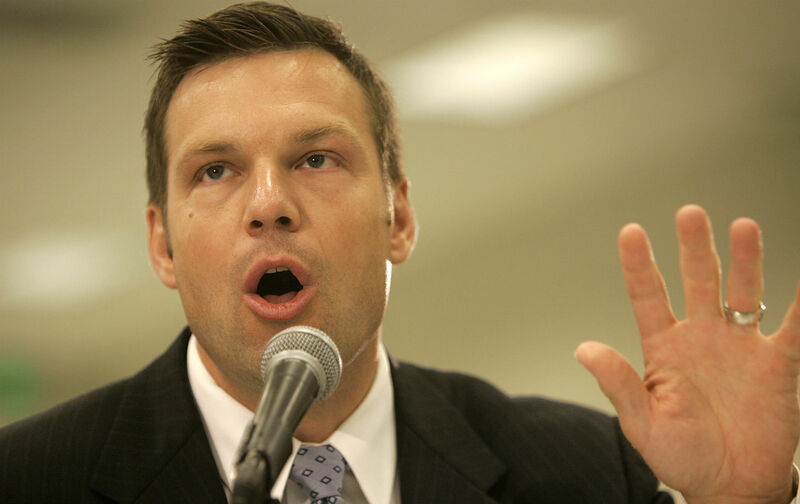 Kobach sued the Election Assistance Commission, asserting that Kansas was within its constitutional authority to require would-be voters to provide proof of U.S. citizenship. Ultimately, the U.S. Supreme Court refused to hear the case. In 2015, Reuters reported that the high court’s refusal to hear an appeal of the decision in the case of Kobach, et al. v. Election Assistance Commission, et al, had the effect of upholding the ruling handed down in November 2014 by the 10th Circuit Court of Appeals. The 10th Circuit Court of Appeals in Denver ruled that Kansas cannot require proof-of-citizenship documents — almost always a birth certificate or passport — from prospective voters who register using a federal voter registration form. The court also said that a federal agency doesn’t have to alter the form to fit Kansas requirements. Arizona has a similar proof-of-citzenship requirement, and Kobach argued the case on behalf of both states in conjunction with Arizona Secretary of State Ken Bennett. Arizona, of course, had its own controversial state immigration policy to fight for, the law known as S.B. 1070. For any lawful contact made by a law enforcement official or a law enforcement agency of this state or a law enforcement official or a law enforcement agency of a county, city, town or other political subdivision of this state where reasonable suspicion exists that the person is an alien who is unlawfully present in the United States, a reasonable attempt shall be made, when practicable, to determine the immigration status of the person, except if the determination may hinder or obstruct an investigation. In 2012 the U.S. Supreme Court overturned much of S.B. 1070, but the provision requiring proof of citizenship was untouched by the high court's decision. In September 2016, Arizona ceased asking for papers as part of a legal settlement of suits filed by a coalition of immigrant advocacy groups. There's no doubt that his experience in drafting and defending strict immigration legislation will help Kris Kobach construct and carry out President-elect Trump's broad plan of clamping down on the number of immigrants crossing the southern border.